Pro-Visual Publishing in conjunction with partner Master Plumbers Australia has proudly released their latest edition of the Augmented Reality (AR) Plumbing Industry Guide to Safety, distributed free of charge Australia-wide. The wall-mountable printed guide is designed to be displayed in an easily accessible place, visible to plumbers. By being on display it will help to aid in the promotion of health and safety and serve as a constant reminder to plumbers of potential hazards and threats that could jeopardise ones safety in the workplace. The topics for this year’s guide have been carefully selected and are issues that are pertinent to the industry in regards to safety and include information about working and being exposed to asbestos, working with gas, excavation work and high pressure water jetting. As mentioned, the guide features AR, a digitised feature aimed at enhancing engagement and offers an aspect of interactivity. By simply downloading the free Pro-Vis AR app and scanning over any AR capable content, users can access further safety information straight to their smart device, for example, videos and PDF files. 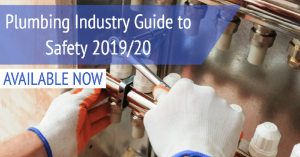 “I would like to thank all the sponsors of the Plumbing Industry Guide to 2019/20 Their support has made it possible for the Guide to be distributed free of charge,” says Pro Visual Publishing CEO John Hutchings.